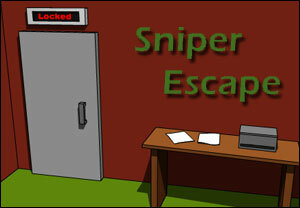 Sniper Escape is a new Room Escape game developed by Dom Chapman, the author of Bad Reception, E-Scape, DIY Escape, Locked In, Stuck Inside, the Trapped series and many more. Search for clues and items and don’t forget to press the spacebar if you want to put an item away! Ok here’s a quick walkthrough. 1. Find the scope behind the box in front of you. 2. Find the rifle behind the safe. 3. Find the “tube” behind the metal box on the table. 4. Go over to the box which was in front of you when you started, and put the rifle together. 6. That code you just saw is the code to the safe, go over to the safe and type in the code. There will be ammo inside it. 7. Pick up the ammo and put it on the rifle in the box that was in front of you when you started. 8. Now get the screwdriver from under the computer table, and get the USB from the bottom of the metal cabinet thing. 9. Go over to the computer, turn it on by clicking the button on the bottom of the computer tower, use the screwdriver to open the little box on the front of the computer tower, and put the USB into the hole. 11. Now, go over to the cardboard box thats on the left hand side of the computer table, and there should be a number with all the other numbers crossed out. Memorize it (its only 1 number so you dont need to write it down). 12. Now, go back to the hole in the wall and look for a cardboard box, the rest of the numbers for the code will be on that box. (NOTE: The 1 number that you just saw in the room you are in, is the FIRST number to the code, the numbers through the hole are after that number). 13. Now you’ve got the code, go over to the computer and type the code in. It should now have a window with a server number. You don’t need the username, just memorize the server. 14. Now that you know the server, go over to the hole in the wall and look to the right for a hole bunch of server numbers, you have to shoot the server number you saw on the screen. 15. When you’ve shot the server number through the hole in the wall, go back to the computer where it will have a screen saying “Cannot connect to server 008.” now you need the p***word that you got of the USB. Type in the p***word you got off the USB and change the door system from Locked to Unlocked by clicking on the “Locked”. 16. Now go over to the door, click the handle and you’ve escaped :). on the usb stick. Unlock the door and out you go! i am stuck on the bit where you have to put the user name and server in the comuter please help!?!?!?! look through crack and shoot server 008. YYYYYYEEEEEEEEESSSSS 2 times in 5 min! go next to the safe, click the shadow of the place where you build to rifle, click the little black thing. y cnt i go behind the safe???????????????????????????????? Posted on Monday, April 7th, 2008. Follow any responses through the RSS 2.0 feed.